It is an offence to organise or attend a meeting or possess the animals for that purpose. A permanent ban on hare coursing events has been introduced in Northern Ireland. Environment Minister Alex Attwood said: "Hare coursing events should not take place in a modern, progressive, civilised society. We all have a responsibility to protect our wildlife and certainly I want to do everything in my power to do that. The ban is part of the Wildlife and Natural Environment Act which has become law. This legislation is the primary way of conserving Northern Ireland's threatened wildlife. The Assembly voted for a permanent ban in June of last year under previous Environment Minister Edwin Poots. Many MLAs spoke against the staging of coursing events where muzzled greyhounds race after a hare. 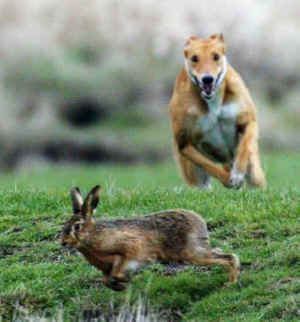 While injuries to hares declined sharply after the introduction of muzzles, coursing meetings have remained controversial in Northern Ireland and have been the subject of a series of temporary bans since the measure was first introduced in 2004. Former Environment Minister Angela Smith supported the ban and it was upheld by the Northern Ireland High Court. Opponents of the practice like the League Against Cruel Sports maintain that most people in Northern Ireland support a ban. Advocates like the Countryside Alliance believe the number of hares has increased. Mary Friel, the League's Northern Ireland campaigner, said: "The League Against Cruel Sports is delighted that the Northern Ireland Assembly has finally and permanently banned the barbaric sport of hare coursing."